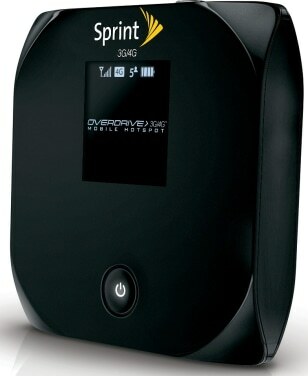 Sprint's Overdrive 3G/4G Mobile Hotspot lets users connect up to five wireless devices, including laptops and smartphones, simultaneously. It takes advantage of Sprint's 4G WiMAX network for the best speed. The device is a little over 3 inches-by-3 inches, and less than an inch thick.